The new Sony FMP-X1 4K Media Player will be hitting store shelves this summer, to complement the company’s latest 4K Ultra HD LED TVs that we introduced you to earlier this April HERE. This 4K media player currently presents the only to get 4K (3840 x 2160 resolution) content, since no broadcast 4K content is currently available, and probably won’t be for a while. There are 10 films included on the Sony Media Player including Bad Teacher, Battle: Los Angeles, The Bridge on the River Kwai, The Karate Kid (2010), Salt, Taxi Driver, That’s My Boy, The Amazing Spider-Man, The Other Guys and Total Recall (2012). In the fall of 2013, 4K media player owners will be given access to a fee-based video distribution service offering a library of 4K titles from Sony Pictures Entertainment and other notable production houses. Making good on its promise to periodically update and add content to the system, Sony recently began delivering new 4K content to 84-inch XBR owners with the home server. Along with a slew of new 4K video shorts, the classic film Lawrence of Arabia has been added to their libraries, which was recently remastered in 4K resolution by Sony Pictures Colorworks. Owners of the first generation video server will be able to exchange that device for the FMP-X1 4K Media Player, once the distribution service launches in the fall. To coincide with the availability of Sony’s new 4K Ultra HD TVs, Sony Pictures Home Entertainment is also bringing to market a lineup of “Mastered in 4K Blu-ray Discs. With 1080p high definition picture that’s derived from the highest quality 4K source materials with new expanded color, consumers will enjoy a dynamic and vibrant picture that’s both optimized for the 4K Ultra HD TVs and plays back on all existing Blu-ray players and HDTVs. As an added bonus, consumers who purchase the XBR-55X900A or XBR-65X900A 4K Ultra HD TV will also receive Spider-Man (2002), Ghostbusters and Angels & Demons “Mastered in 4K” Blu-ray Discs (while supplies last). 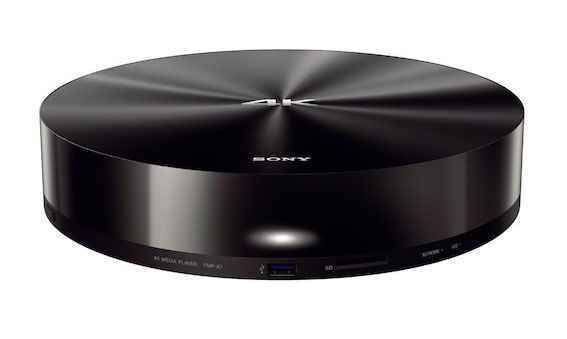 The Sony FMP-X1 4K Media Player will be available summer 2013 for $699 US, which will come bundled with 10 feature films and video shorts in true 4K resolution.